There is nothing more exciting than the start of a NASCAR® race. The roar of the crowd, the thunder of the high-octane engines, and the spectacle of the event can overwhelm the senses and send adrenaline pumping into the very core of my artist's imagination. So it was at Talladega Superspeedway®. The "flag to flag" competition that typifies this behemoth track is some of the most exciting of any NASCAR season. With its long, four-wide backstretch and high-banked turns, the speeding gladiators of the raceway thrilled my eye with every lead change. But beyond the rush of this competition, I also wanted to capture the spirit of Talladega, a legendary venue in motorsports. To do this, I blended the past with the present and modeled the track through my eyes to become timeless in its depiction. With "Number 3," Dale Earnhardt, taking the checkered flag, his personal NASCAR accomplishments become further cemented into history. He, in my eyes, remains the "Dominator" at Talladega. 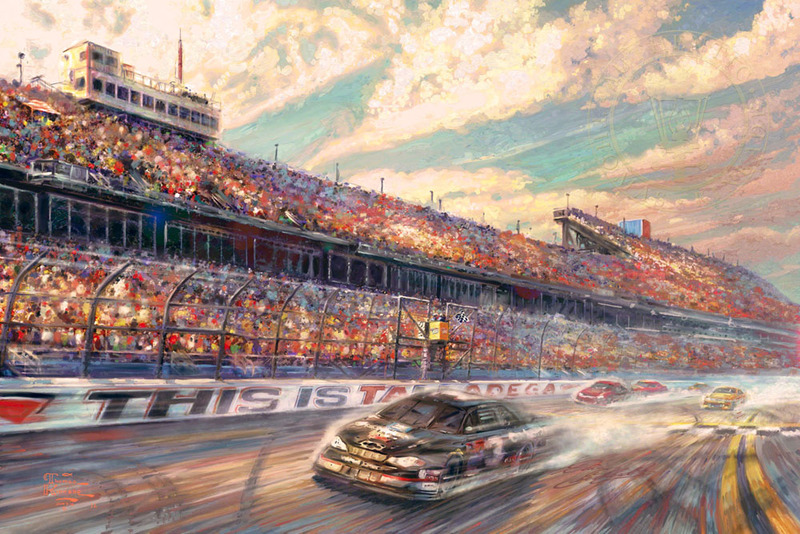 Whether a focal point for your family's enjoyment of racing or as part of a larger personal collection of sports memorabilia and art, I hope you enjoy This is Talladega, my vision of a great track, now and forever.